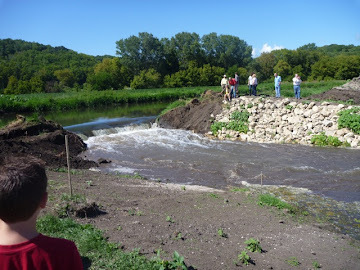 In September, Groundswell, in partnership with Dane County, completed a 45-acre conservation easement that permanently protects and creates public access to over one mile of a newly restored stretch of Black Earth Creek just east of Mazomanie (click for map). The easement is part of an ambitious project to develop the first segment of the Good Neighbor Trail between Mazomanie and the City of Middleton. A partnership of local governments and non-profit groups is spearheading the trail effort, which involves restoring the creek, reducing erosion along the stream bank and reconnecting the stream to its floodplain. This easement is our 10th completed project in the Black Earth Creek valley, which is a priority conservation area for Groundswell. Over the last decade, we have permanently protected over 760 acres of important lands in this iconic landscape in western Dane County. Our thanks go to Fred Wolf and his family, whose generosity made this project possible. Additional funding came from the Knowles-Nelson Stewardship Program and Groundswell members. Watch a 3-minute video about the how the Wolf Run Trail is reconnecting a community with Black Earth Creek.